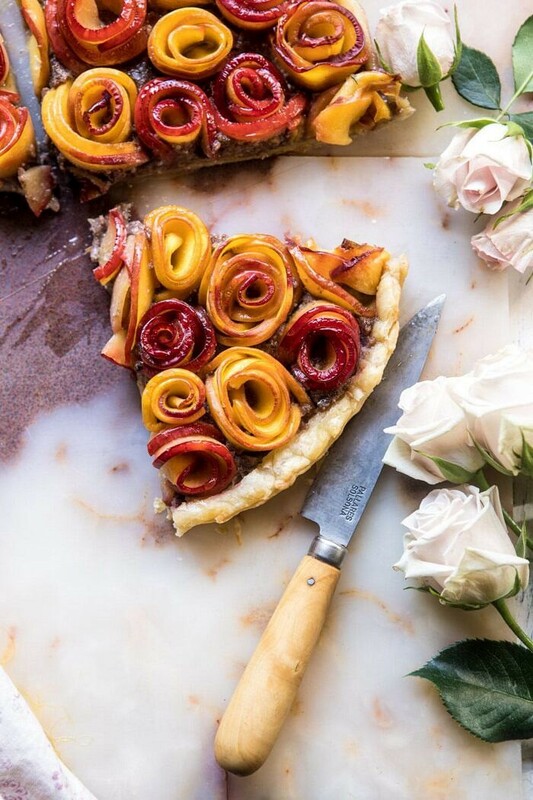 Sweet Peach Rose Tart. Have you ever seen such a pretty tart?! 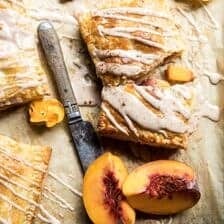 It’s made using puff pastry, sweet honey, and lots of fresh peaches, nectarines, and plums. It might look hard to create, but it’s really not as tricky as you may think. Plus any extra effort is totally worth it, because not only is this tart pretty, it’s also so DELICIOUS. This tart and will be the topic of conversation anywhere you take it! YOU GUYS! So sorry for all the shouting here, but I am in LOVE with this simple…ish summery tart. 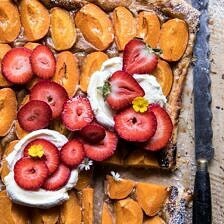 There are some recipes that I just get way too excited about and this tart is most definitely one of them. It’s screams summer, it’s melt in your mouth good, and it’s pretty! 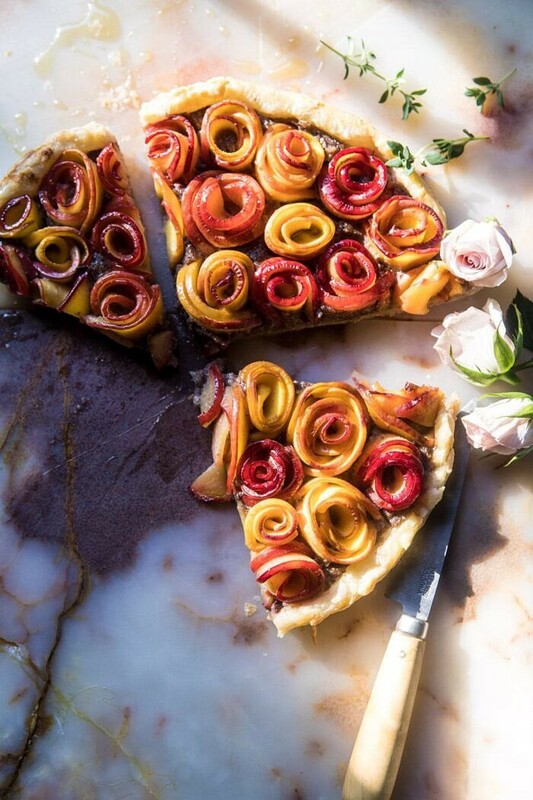 All the things I love, and all in one tart. When scheming up recipes for the month, I had no idea this was going to be one of the recipes I’d create. 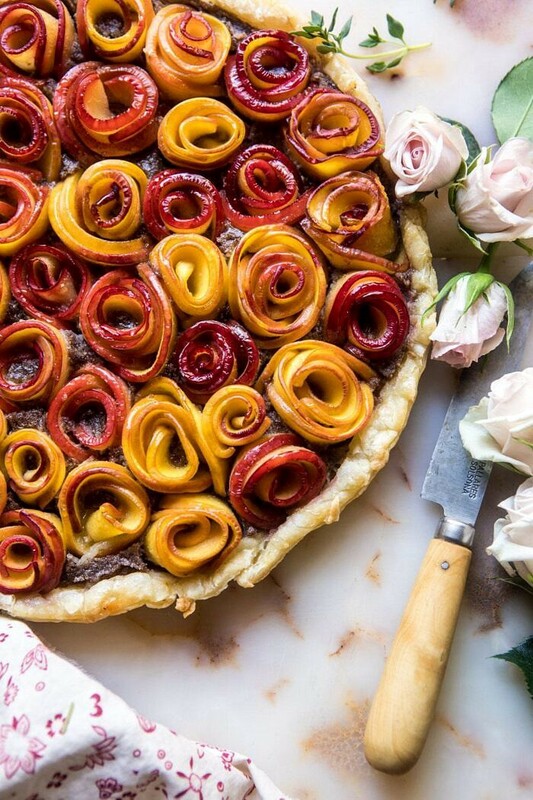 But after seeing the apple version of this tart floating around on Pinterest, I suddenly had the very strong desire to create my own rose tart, only with peaches, nectarines, and red plums. I then proceeded to spend the next six plus hours working on developing and perfecting this recipe. This was a little over a week ago and I’ve been dying to tell you about it ever since. I had to wait until just the right day to share, and today’s the day. Mainly because it’s Friday, but also because we are now more than mid way through July, and summer stone fruit season is in full swing. 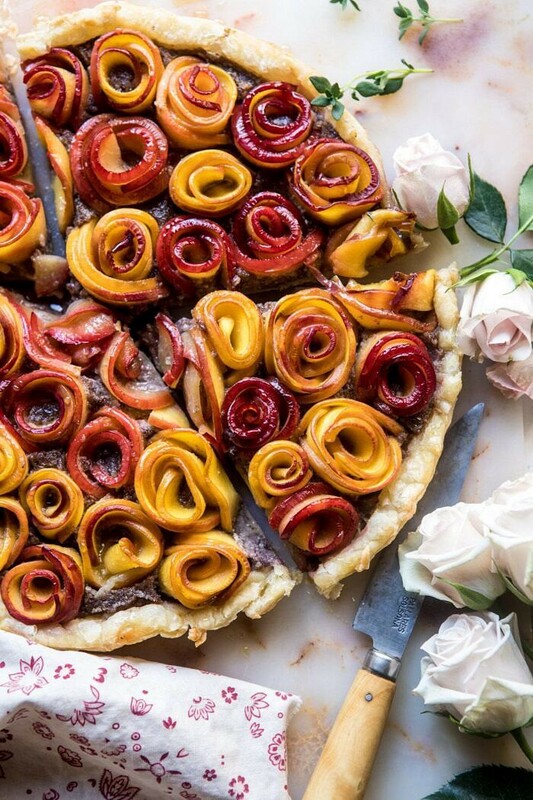 So it’s time we talk all things peaches, nectarines, plums, and french inspired rose tarts. I’m not going to sugar coat anything here, this tart will take you some tome to create, but it’s fun, and it’s the perfect weekend baking project. For the most part, I’ve really been trying to stick to rather simple recipes because I totally get that life is busy and no one has time to spend hours in the kitchen every single day…except for me, but hey, it’s kind of my job. Sometimes though, I really just want to share the recipes that are truly inspiring and exciting me most, and right now it’s this tart. 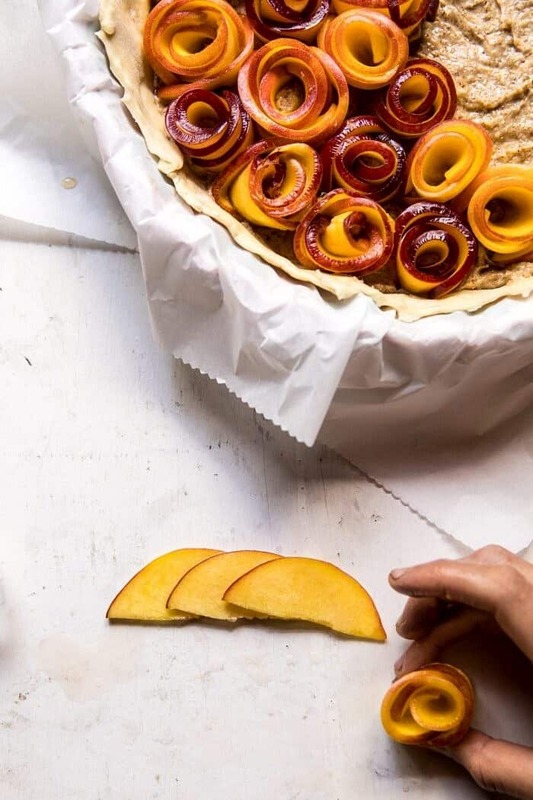 It will take longer than thirty minutes to make, but the good news is that this tart is packed full of delicious summer stone fruit. And while it is a little more time consuming than you might prefer, it’s truly a show stopper, and anyone you serve it to is going to be highly impressed. I know I said this, but it really is worth all the effort. Trust me, I would not steer you wrong. There are three things I need to stress right off the bat with this tart. Thing one, yes it will take you some time to create all these little roses, but I promise it’s not too hard and if you put on some good music, or your favorite podcast, time will fly. Thing two, you absolutely just cannot stress about creating perfect roses because unless you’re a pro baker, it’s just not happening…and that’s OK. I personally love the imperfect look. It’s REAL. Thing three, use a mix of peaches, nectarines, and plums for different shades of pinks, reds, and yellows. It makes for a gorgeous tart. Just be sure that your stone fruit is firm to the touch and not soft. The recipe and ingredients are actually super simple. For the tart’s crust, I just used store-bought puff pastry. It’s kind of my go-to when making tarts because it’s easy, and I personally couldn’t make anything better myself. Sometimes store-bought is OK. The filling is very much inspired by a french frangipane tart. 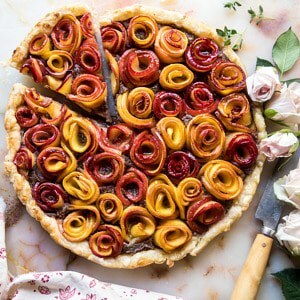 I used nuts, butter, and egg yolk to create a creamy base, and then topped that with my peach, nectarine, and plum roses. Very simple, very good. Now the hard part, forming the roses, which really isn’t as hard as you might think. It’s important to slice the peaches very thin so that they are easily bendable. This is the key to creating the roses. 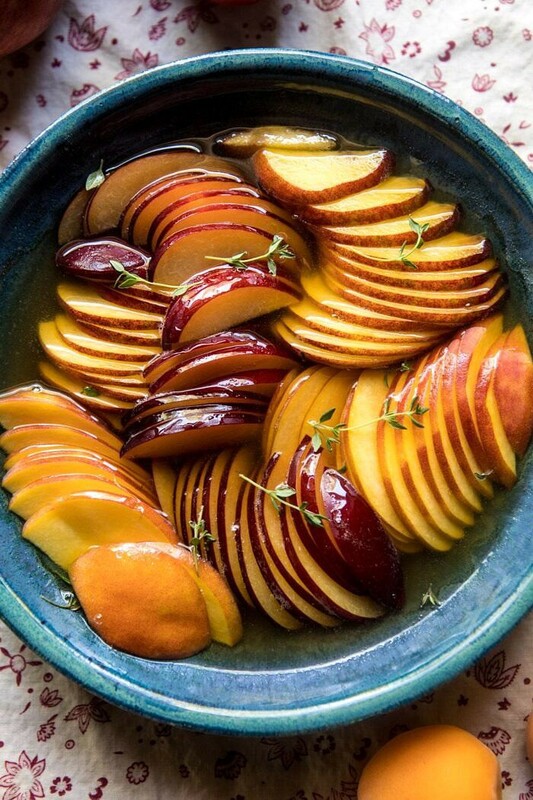 The fruit gets soak in thyme infuse honey, which adds sweetness and flavor, but softens the fruit and makes it easier to shape and bend into a rose. I tried my best to provide some process shots of forming the roses, so take a look at those before baking this. I will also be adding a how-to video as soon as I can, so stay tuned for that. It’s on my list of videos to make for our next filming week. Once you have the roses all in place, brush the remaining honey over top and then bake. Not too bad, right? I highly recommend listening to music or a podcast while you do this and just zoning out. I actually had so much fun creating this dish, and really want to do it again soon before summer is over. Who is in? Cool. Cool. Oh and lastly? I know you don’t see any in the photos, but this tart is beyond delicious with a scoop of vanilla ice cream, oh, and an extra drizzle of honey too. You have to try it, SO GOOD. 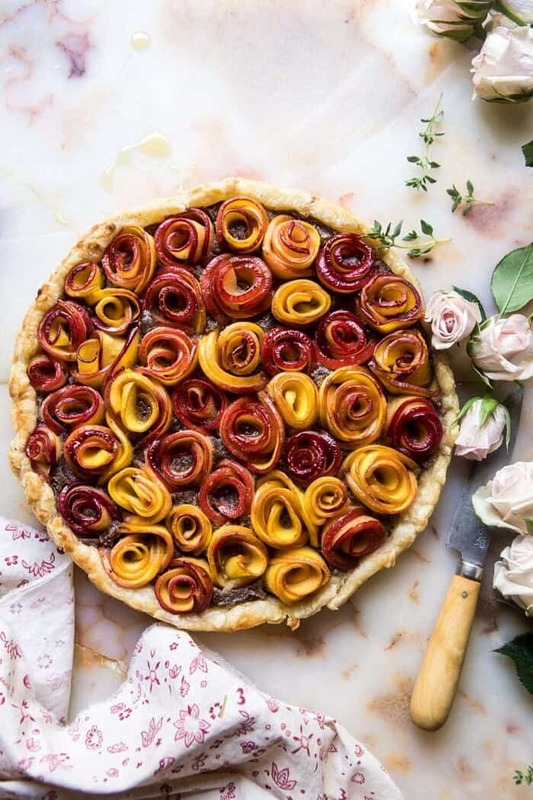 If you make this sweet peach rose tart, please be sure to leave a comment and/or give this recipe a rating! I love hearing from you guys and always do my best to respond to each and every one of you. Oh, and of course, if you do make this tart, don’t forget to also tag me on Instagram so I can see! Looking through the photos of recipes you all have made is my favorite! 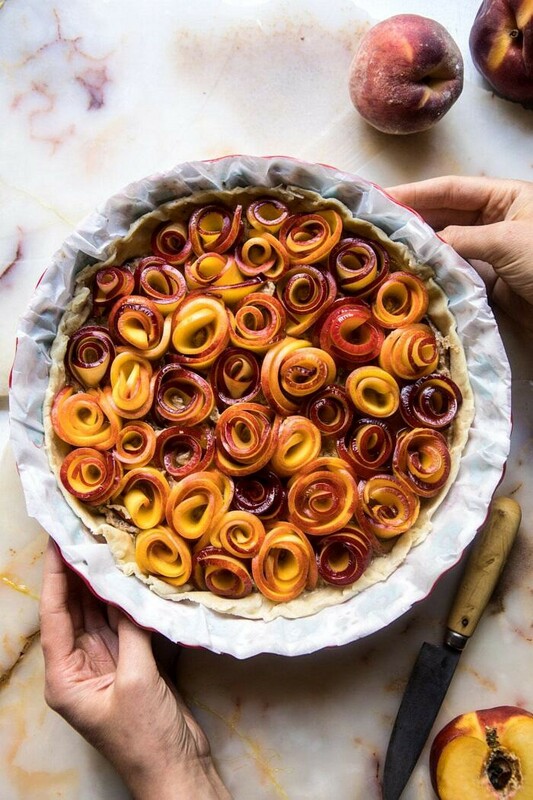 Made using puff pastry, sweet honey, and lots of fresh peaches, nectarines, and plums. 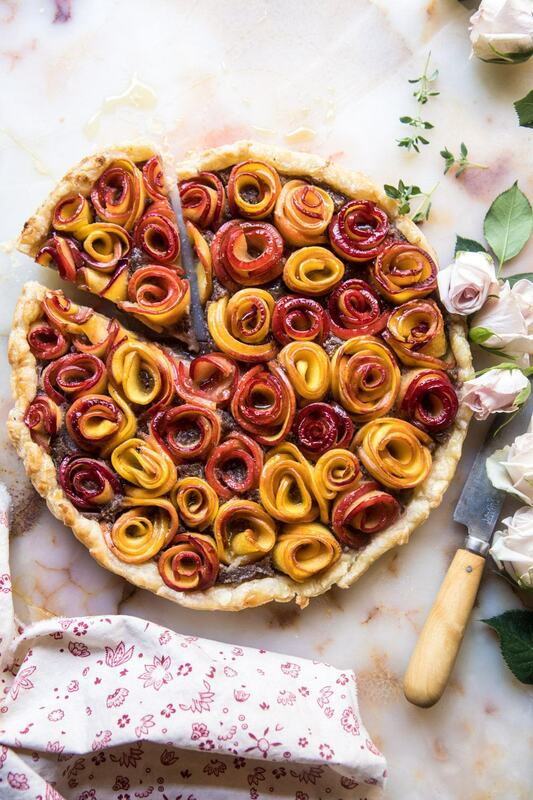 Any extra effort put into creating this will be totally worth it, because not only is this tart pretty, it's also so DELICIOUS. This tart and will be the topic of conversation anywhere you take it! 1. Slice the fruit very thin using a mandolin or a sharp knife. Place the fruit in a heat proof bowl. 2. Heat the honey, thyme, vanilla and sea salt in a small sauce pan over medium heat until the sauce just comes to a boil. Remove from the heat and pour the honey sauce over the sliced peaches. Let sit 5-10 minutes. 3. Line a 10 inch pie plate or tart pan with parchment paper. Roll the pastry out into 1/4 inch thickness and fit inside the pie plate. Trim the pastry around the edges. 4. In the bowl of a food processor, combine the nuts, butter, and egg yolk and pulse until mostly smooth. Spread inside the pastry. 5. Arrange 3-4 fruit slices lengthwise, overlapping each slightly on a clean counter (see photo above). Roll the fruit from left to right to create a rose (see photo above). Place the roses into the prepared dish, pressing them gently into the nut spread to adhere, it's OK if your roses are not perfect. Don't stress. Repeat with the remaining fruit, placing the roses in the prepared dish as your work. Brush any honey sauce left in the bowl over the roses. Place the tart in the fridge for 15 minutes to chill. 6. Preheat the oven to 375 degrees F. Remove the tart from the fridge and transfer to the oven. Bake for 35-45 minutes or until the pastry is golden. Let the tart cool 10 minutes before lifting out of the pie plate. 7. Serve warm or at room temperature with honey and vanilla ice cream. Enjoy! No Bake Mixed Berry Custard Tart. 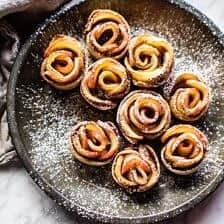 Mini Pecan Butter Apple Rose Tarts. Thank you so much! I hope your child loves this! Ah so awesome! I will totally watch that part! Thanks Liz! Wow så pretty!! May I ask what kind of stone your using as the background? So gorgeous! DO you think this would freeze well? Thinking of making this a couple days ahead of time for some guests. Should I use salted or unsalted butter? Thanks! 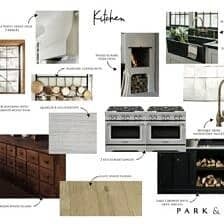 This is beautiful, I can’t wait to make it! I did have a question though – I hate thyme. 🙁 Is there another herb I could substitute in? Thanks! 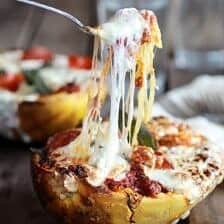 This pie looks amazing.However, the photo on the keto ad was offensive to me. Please screen more carefully. I want to see food related ads not sexual ones. Hi Linda, I am so sorry about that! I was not aware that ad was popping up. I will look into that! This is beautiful! And YES for store bought pastry – ain’t nothing wrong with that! Have you ever made your own puff pastry? I’ve been wanting to try, but it always looks so daunting! Hi Rachel! I usually use store bought puff pastry! I hope you try this recipe! This is seriously such an art and a love the twist with the peaches. 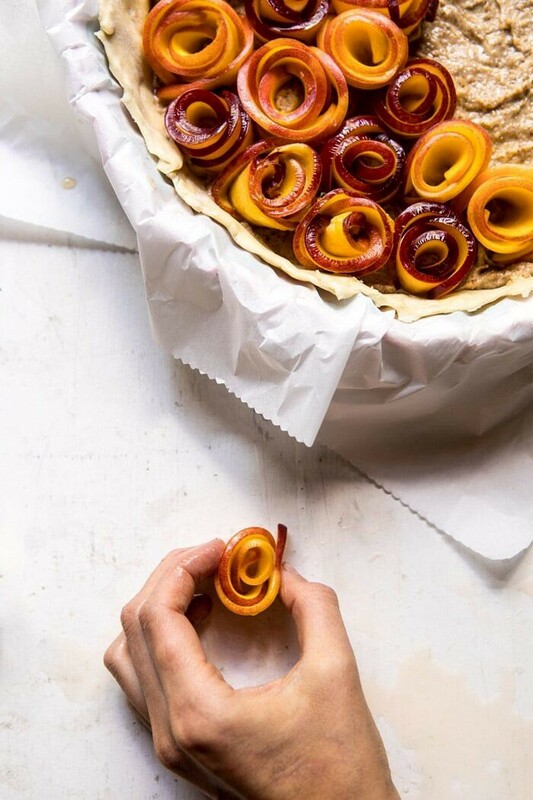 How do you get the peaches from unrolling when you add them to the pastry. Tried making it but had the hardest time getting them to stay together. Thank you so much Ivana! I hope you love this! I have bakery please send me some recipes. 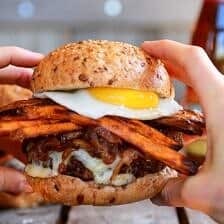 Is there a way to make this without a food processor? I really really want to try to make this, and was thinking of just chopping the nuts as finely as I can and mixing it with the other ingredients, but I’d hate to go through all the work and have it not work out because that. Thank you! I am so glad you loved this recipe! Sarah, I’ve already made this tart, so I know the texture of this filing. I don’t think that chopping nuts very finely would do the trick. On your place I’d try using pestle and mortar. Smash them as smoothly as you can (it should create kind of nut butter/spread texture) leaving some really tiny pieces of nut since recipe calls for mostly smooth mixure and then add soft butter and a egg yolk. I hope it’s the correct way to do this without food processor and you will understand everything, which I writed, english isn’t my first language. 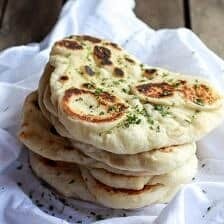 Hi there Tieghan, long-time lurker and major fan, and have tried many of your recipes with much success!! Keep up the amazing food creativity! 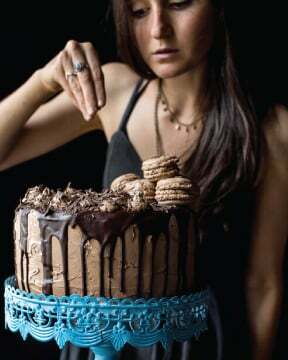 This one looks amazing and I can’t wait to make this for an upcoming event I’m hosting. Question, can’t tell by the recipe: are you saying to use a mix of all three (plums, nectarines and peaches) 4 each or 4 total. Looking at the pictures, I’m thinking the former? Also, I agree, my first thought was: vanilla ice cream as a complement!!! it looks soooo pretty!!! like a bouquet of flowers! 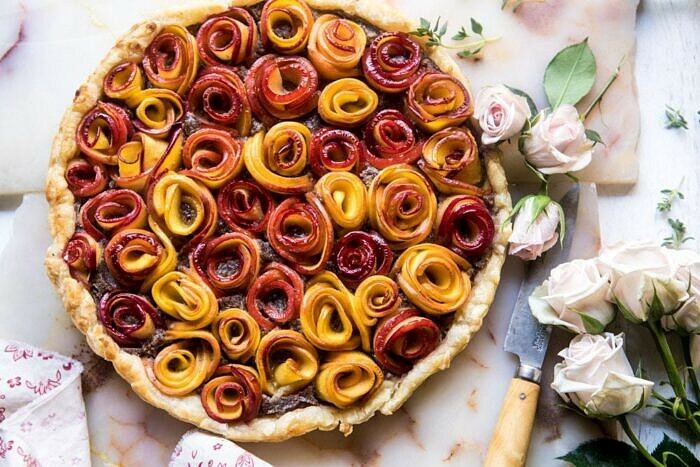 what beautiful food art, and love these flavors in a tart, to have made “roses” out of the peaches is real genius, this is the best of summer, thank you! Thank you Sabrina! I am so glad you like this recipe and hope you try it! This is so easy, I used a scratch butter and cream cheese pastry. I put the nut base in the center leaving 2 inch around the crust. After making the roses I add a bit of flour to the remaining preach and placed then around the 2 inch rim. Note: If your peaches don’t roll up microwave them for 1 min. amazing how much easier they rolled. Thinner next time. This tart is beautiful and yummy. Thank you so much Loriann! I am so glad you liked this recipe! This was lovely! I adore the honey-vanilla-thyme combo in the sauce! I grow lemon thyme out in the garden, so I used a couple sprigs of that instead of traditional thyme. It was great! Most definitely worth the work! Thanks for sharing!! Thank you Kate! I am so glad you loved this recipe! OMG, I have never seen anything more beautiful! I absolutely love this idea. 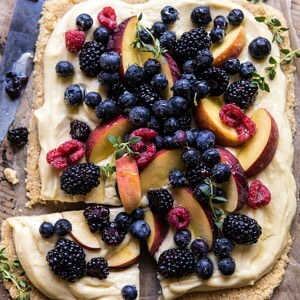 This tart would look incredible at a summer brunch party! I got so many compliments on this! It was beautiful, and the peaches were delicious. Only things was that it was very savory because the pecan base has no sugar, so people thought it was a savory tart. Is it supposed to be? I think if I made it again I’d add honey or brown sugar to the pecan butter base. This is beautiful, delicious and I would love to try it! However, we have a tree nut allergy in my house. Do you think there is an alternative to pecan/almonds? I love them but would love for my whole family to try this. Would peanuts or sunflower seeds be an ok alternative for flavor and stability? I had a hard time getting the roses to stick. Next time i will double the almond filling. HI Kelly! Sorry about that I hope this works out better next time. Is there any questions I could answer for this to turn out better? 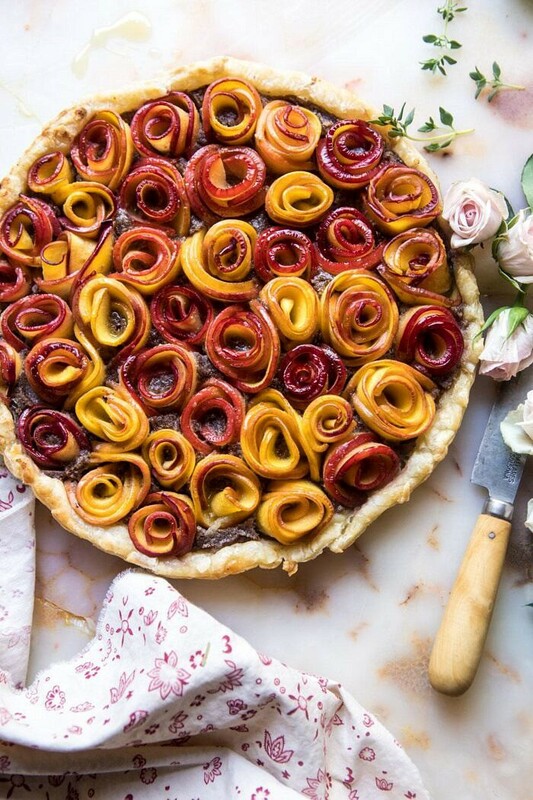 Could I use apples instead of peaches for this recipe? Do you think the cook time would be the same? 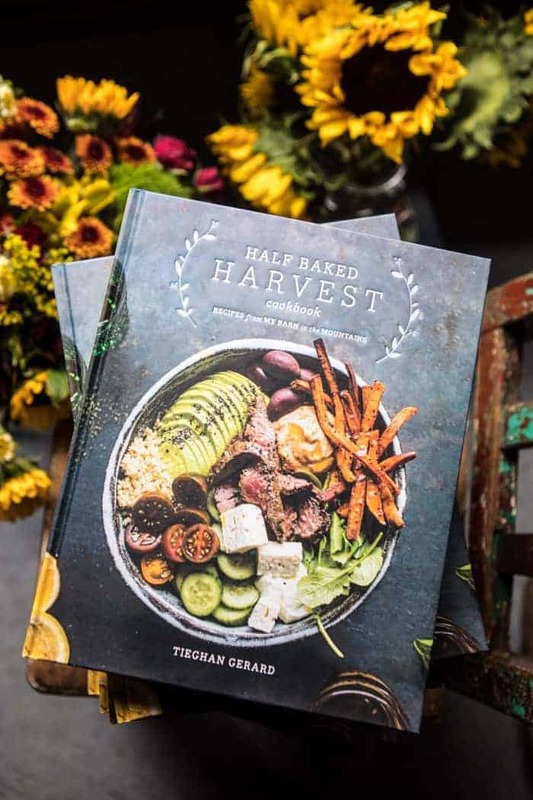 Hi Tieghan, this looks amazing! Just wondering if you would have any suggestions for a nut substitute? My friend has an allergy to nuts and sunflower seeds. Would oats work maybe? Can’t wait to try this.